This love bug magnet is one bug you won't mind having in your house. These are perfect for a Valentine's gift or anytime. With heart shaped wings and hearts for cheeks he will just spread the love. Buy one for yourself or give one as a gift. If you receive this you will know you have been bitten by love. 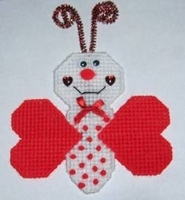 Each love bug is a handmade plastic canvas magnet durable for years and years of use. Approx size is 7"h x 6"w.